5 Neat ThingsJolie Kerr is a cleaning expert, advice columnist and the host of the podcast “[Ask a Clean Person](https://itunes.apple.com/us/podcast/ask-a-clean-person/id996183661?i=1000382315226&mt=2).” Each week, she’ll round up five essential cleaning products, tools and organizational systems to help you live your tidiest lives. Maybe you’re new to hosting Thanksgiving, or maybe you’re an old hand, but either way, if you’re having a big holiday gathering in your home this year, you’re probably anticipating making a big old mess in your kitchen and dining room. Help is here! When you’re making your shopping list, think about adding some of these items to it in anticipation of cleaning up after your holiday meal. Do you need product recs? Email Jolie or tweet at her with requests or questions! Even if you do most of the holiday cooking in old clothes that can get splattered with grease and cranberry and wine (it’s for the cooking, okay?!? ), there’s always those last minute tasks, like making gravy and transferring sweet potatoes into a serving dish, that can muck up your nice holiday outfit. 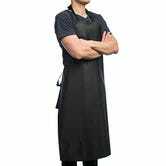 Having an apron around when you’re hosting is a good idea, even if you don’t plan to wear it for the majority of your cooking — and this one is especially great because it’s waterproof, which means 1. you can wear it for doing dishes, in addition to cooking and 2. it doesn’t even need to be washed, you can just wipe it off and put it away until the next big meal you’re serving in your home. You can come to me after the holidays asking how to undo damage caused by putting a too-hot serving dish down on your wood table, or you can get a set of table pads. These are meant to used under a tablecloth to put a protective barrier between it — and whatever is getting set down on top of it — and the table itself. The Homecrate table pad can be trimmed, so you can cut it to fit your table, and it’s waterproof, so it can be easily wiped off while still protecting wood tables from water damage. 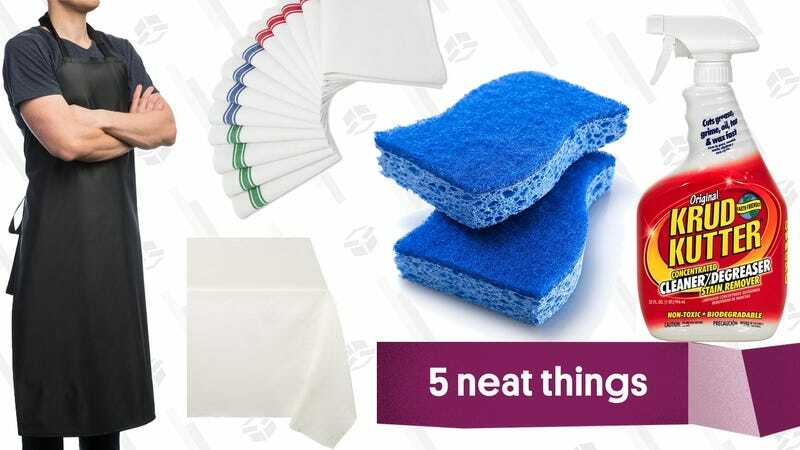 Not all sponges are created equal, and on a dish-doing intensive occasion like Thanksgiving, it’s a good idea to have an assortment for every job you’ll be faced with. For dishes, silverware and glass, opt for Scotch-Brite Non-Scratch Scrub Sponges, which will get stuck-on food off without damaging more delicate items. For pots, pans and baking dishes, the Scrotch-Brite Heavy-Duty Sponges are what you want to scour away baked-on food. For badly scorched cookware or major spills in the oven or refrigerator, a Dobie Pad will give you extra scouring power but is safe enough to use on plastic, stainless steel and enamel without scratching. 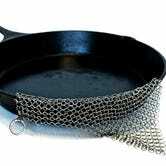 If you’ll be cooking with cast iron, or if you have a tendency to blacken at least one dish, The Ringer chainmail scrubber will be a lifesaver for you this holiday season. By “good dish soap” I don’t mean the fancy Mrs. Meyer’s or Caldrea stuff. Those have their place! But when it comes to tackling a major pile of pots and pans and serving dishes and etc etc etc. 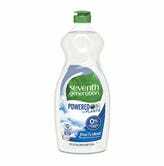 go for a brand of dish soap that gets high marks in testing, like Dawn, Palmolive or Seventh Generation. 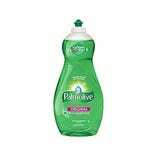 A good grease-cutting dish soap can serve plenty of purposes beyond just washing the dishes; it can also be diluted in hot water to make a solution that can clean stovetops and countertops that have been ravaged by the cooking of the holiday meal. 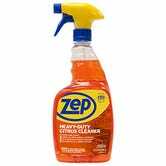 For really big kitchen messes, however, opt for a degreasing spray like Krud Kutter Cleaner/Degreaser or Zep Heavy-Duty Citrus Degreaser. We’ve established that, if you’re hosting Thanksgiving — or any kind of gathering involving lots of people and lots of food— you’ll wind up doing a lot of dishes. That means you’re going to want dish towels, and lots of them. They can be used to dry things by hand so that they can be put away quickly to make room for all the other stuff that needs to be washed, they can be laid out on a countertop to make extra space to lay just-washed items, they can wipe up the puddles of water that tend to form when a big load of dishes are being done by hand all at once. 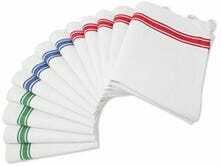 Think about how many dish towels you’ll need for the big day. Now triple that. Buy that many.